As per usual during the World Championship, Barry Hearn took the opportunity to make some announcements to the assembled media. There will be an increase in prize money, with £500000 for the WC winner, but also interestingly more money for the second and third rounds losers. There will also be more events. The new Tour Championship will be added to World Snooker’s calendar for the first time in 2019, televised by ITV4. The event will run from March 19 to 24, with the leading eight players from the one year ranking list, after the seeding cut off point, competing for total prize money of £375,000 and a top prize of £150,000. This follows in the series incorporating the World Grand Prix, which is for the leading 32 players on the one year list, and the Players Championship which is for the top 16. World Snooker Chairman Barry Hearn said: “We are delighted to add the Tour Championship to our global calendar, it will be a highly prestigious event for the best players in the world. “The race to qualify for this series of tournaments begins from the very first moment of the 2018/19 season, and every pound earned counts. All players will be striving throughout the season to move up the one-year ranking list and make it to these three crucial and highly lucrative events. The venue and ticket details for the Tour Championship will be announced soon, as will the calendar and seeding cut-off points for the 2018/19 season. That’s excellent news. ITV coverage is always excellent. However I hope it will be available on Eurosport somehow as well because ITV is not easy to access if you are not in the UK. Speaking to John Parrott and Stephen Hendry during the MSI of this afternoon match, Hearn said that matches in this event will be long format: best of 17, best of 19 and best of 25. Snooker’s Shoot Out event will be televised live by Eurosport and Quest for the first time next season. The world ranking tournament, which has been running since 2011, has a unique set of rules, with matches lasting a maximum of ten minutes and a shot clock of 15 seconds for the first five minutes and ten seconds for the last five. Broadcast of the event has now been incorporated into World Snooker’s long-term partnership with Eurosport and Quest, which runs until 2026. The Shoot Out brings the total number of events broadcast by Eurosport to 19 (17 in the UK) with qualifying rounds and other events available on Eurosport Player. The 2019 Shoot Out will run from February 21-24, at the Watford Colosseum, with Eurosport and Quest as the host broadcaster. The tournament features 128 players in a flat draw, each needing to win seven matches to take the title. 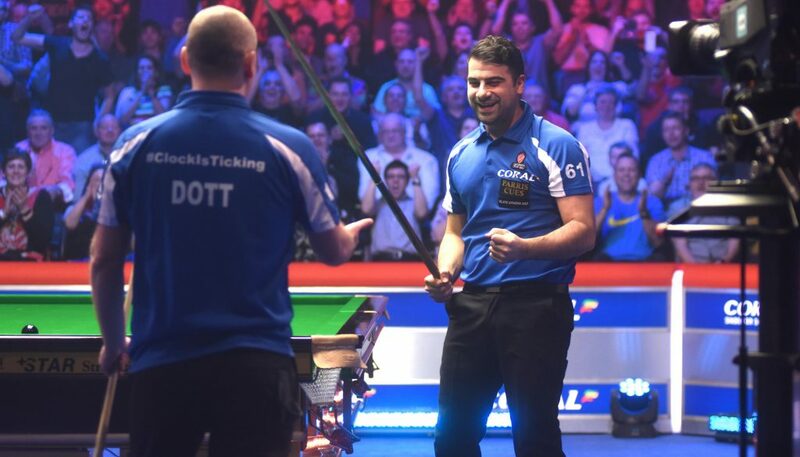 Michael Georgiou captured the trophy for the first time in 2018, beating Graeme Dott in a dramatic final. World Snooker Chairman Barry Hearn said: “We are delighted to be working with Eurosport and Quest on the Shoot Out for the first time. We have established a fantastic partnership with them in recent years. Eurosport really is the Home of Snooker, broadcasting to 137 million homes in 54 countries. We have also seen incredible viewing figures on Quest since they first televised snooker in 2016. “The Shoot Out is a wonderful event which has become one of the highlights of the season for fans who enjoy the fast and furious pace of play. The 2018 Shoot Out was the best I have ever seen, with so many matches going down to the last few seconds, including the final which was a great moment for Michael Georgiou. It’s a chance for up and coming players to make a name for themselves. The agreement to broadcast the Shoot Out supplements Eurosport’s coverage of world-class snooker throughout the season. The pan-European broadcaster already screens in excess of 800 hours of live snooker action throughout the season. Laurent Prud’homme, Senior Vice President Rights Acquisition and Syndication at Eurosport, said: “The idea of making snooker quicker and more appealing to a wider viewership through the Shoot Out concept aligns neatly with our own objective to appeal to new and younger and audiences. “We’re delighted to secure the rights to showcase the Shoot Out on Eurosport and Quest in the UK and are already looking forward to seeing the best players in the world go toe-to-toe – not only playing against esteemed opponents, but also playing against the clock. Ticket details for the 2019 Shoot Out will be released soon. I’m not sure I’m convinced about this approach. There are basically two types of slow play. One is the slow pace dictated by the situation in the match and on the table and I strongly disagree with any attempt to “clamp” on that. It would only cut off a very important aspect of snooker, the battle of wits and encourage negative shot selections. The other is the deliberate and unnecessary slow play in an attempt to disrupt the opponent concentration and rhythm. That one is tackled by the section 4 of the rules: such behaviour is gamesmanship. That part of the rules is rarely enforced and that has to be addressed by encouraging the referees to use their discretion when they see it happen. Nothing more or different is needed. Some will tell you that this type of deliberate slow play isn’t an issue in snooker. I believe it is. There aren’t MANY culprits, but there are a few players who often resort to this. I have witnessed a prime example of it in the World Championship qualifiers last season, by a player who eventually DID qualify having used these tactics in the last two rounds.